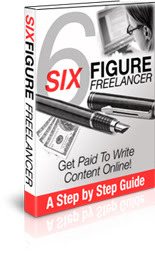 Over the weekend, I read an ebook called 6 Figure Freelancer by David Drake. It's a tricky balance to have personal stories combined with practical information for any freelance writer to earn additional income. From my perspective, Drake achieves this delicate balance in 6 Figure Freelancer. I meet many different writers and all too often they attempt to enter the writing world through a highly competitive area of the market such as writing a novel or writing a children's book. There are many different types of freelance writing and ways to increase your income. I like how Drake tackles the online world with practical information. While it's encouraging, it combines common sense tactics to show writers how to increase their income through the online marketplace. The specific how-to information was loaded with sound advice such as how to avoid scas and specific websites to examine. I reviewed this entire ebook as well as the bonus books. It's an attractive package which I recommend you consider this guaranteed product.